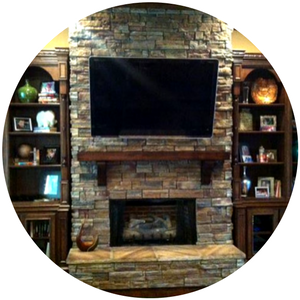 Keller Custom Finishing is truly a one-of-a-kind business based in Northeast Arkansas. Why? Because like our name implies, everything we do is custom. And by custom, we mean made by hand and tailored to your unique requests. But what really sets us apart is the fact that we can breath life back into the old. 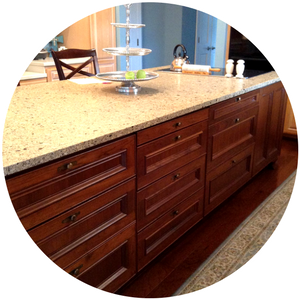 We not only build cabinets from scratch, but we also reface existing kitchen cabinetry. With a little work, we can completely transform the look of your kitchen. Do you want that dream-style space you've seen in the magazines? We can make it happen. How? Well that's part of the magic. We begin with your ideas. And we explore every element of your kitchen such as the colors of your counter tops, flooring, the paint and backsplash on your walls and more to devise a design plan you will love. We add beautiful detail work such as new trimming, extra storage space, wainscoting and other elements to really give you the "wow" factor you want. Since our work is truly custom, we like to visit with you to evaluate your space and discuss your ideas free of charge. And rest assured the quote we give, is the quote you pay. Only special additions made by you during the process will affect the cost. You can also send us photos of your space via email and we can provide a rough estimate. 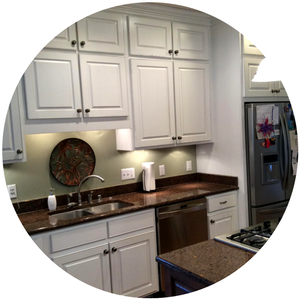 Refurbishing kitchen cabinetry happens to be our specialty but our services go far beyond that. We can deign intricate fireplaces accompanied with elaborate built-in shelving, armoires, custom doors and storage units and so much more. If you can dream it, we can build it. Owned and operated by John and Marylin Keller, Keller Custom Finishing has served the surrounding areas of Weiner, AR for over 25 years. The business first began when John had a request to build a cracked cabinet. Soon after, more requests came and the beloved trade became a full-time passion.